Rev. Patrick E. Brown, CSV, died on April 21, 1926 at the Mayo Brothers Hospital in Rochester, Minnesota. The passing of Fr. 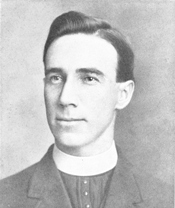 Brown was felt keenly by a multitude of friends and his confreres as he labored as a teacher, missionary and chaplain. Fr. Brown was born in Chicago on July 26, 1883 and received his primary education at Cathedral School. 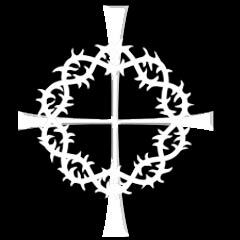 He entered the Clerics of St. Viator and made his vows in the year 1902. He attended St. Viator College and on July 5, 1909 was ordained to the priesthood. He taught for a number of years at St. Viator College, before his superiors discovered his talent as a preacher and they placed him in missionary work. Working out in the field, he truly displayed an apostolic zeal. Endowed with the gift of eloquence as he was, his services were almost always in demand. In 1924, Fr. Brown accepted the invitation of the Rt. Rev. F.C. Kelly, D.D., Bishop of Oklahoma, to become chaplain of the Catholic students at Oklahoma State University. He threw himself into this new task, and the hundreds of students he ministered and taught will never forget his interest in them and devotion. They remembered him as the pleasant, kindly priest whose smiles and words of encouragement lightened up the souls of event the most downhearted. The remains of Fr. Brown were brought to Bourbonnais for burial. A solemn high Mass was celebrated at Maternity BVM Church on Saturday, April 24, 1926 by the Very Rev. Walter J. Surprenant, CSV, provincial of the Clerics of St. Viator. The Rev. Thomas J. McCormick, CSV, acted as Deacon and the Very Rev. Terence J. Rice, CSV, assisted as Sub-deacon. The Rev. 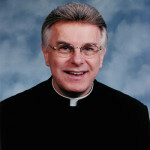 John P. O’Mahoney, CSV, who taught Fr. Brown at the Cathedral School, delivered a touching eulogy on the life of his pupil. Burial was at Maternity Cemetery in Bourbonnais, Illinois.